About a month or so ago I ordered some new products to my store in time for the SENZ Craft Show. I had heard only good comments about the Lindy's Stamp Gang Mists from those in the know, so I ordered some having only ever seen them on YouTube videos. Having tried them at SENZ and on some projects I have created since, I can now honestly say that I am definitely a convert to Lindy's Stamp Gang and so much so that I am applying for their design team because that is how much I love the products. 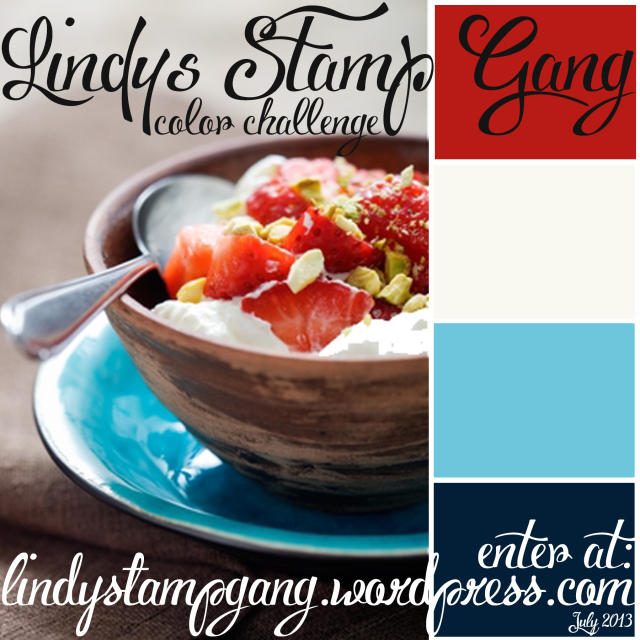 For more information about applying for the Lindy's Stamp Gang Design Team you can check out their blog post here. In order to apply for their design team we have been asked to participate in this months "Color Challenge" on their blog (blog post here). And anyone can enter their Color Challenge - just entering the challenge puts you in the running for some very cool Lindy's Stamp Gang Products. 1. Help spread the word about the Lindy's Color Challenge - done and with pleasure! The more people that enter each month's Color Challenge - the more giveaways they will giveaway! 2. Use Lindy's Stamp Gang Products - done! If you don't have any Lindy's Stamp Gang products then you can buy them from my online store at www.scrapfx.co.nz. Look under "Essentials" for their products. 3. Use a minimum of two colours in the Color Challenge (see the image below) - done! 4. Link the Lindy's Stamp Gang Products to their store - done (well will be by the time you are reading this)! For this challenge I altered a key holder I had purchased at a discount store. I white washed the entire item, inside and out, with watered down white gesso. While the gesso was still wet, I then dabbed it with a paper towel to add some depth by making the white wash less even and to allow the wood grain to show through better. I then adhered some K & Company "Citronella Waves" patterned paper from my stash, inside to cover the back wall of the key holder. In this top picture (taken without the flash) you can see some of the swirling waves (if you look closely enough) but you can't see any of the glitter accents and the colour looks a little darker than what it is in reality. Around the outside I adhered some red patterned paper - source unknown - also from my stash. It was just the perfect colour to coordinate with the red I had used for my flowers... and I love red so it was the obvious choice. In the picture below... same angle but with the camera flash, the colour is closer and you can see the glitter reflected in the glass door but you lose the waves pattern... I think I need to work on my photography skills!! I stamped onto the paper for both sides with VersaMark Watermark Ink using one of the Hero Arts Mixed Design Border acrylic stamps then sprinkled on Lindy's Stamp Gang Embossing Powder in Angel Wings Ruby. This is a clear embossing powder with a red shimmer. When stamped onto the red paper I had chosen for the outside of my altered key holder, the heat embossed image really took on the red of the paper, though is accented oh so beautifully by the red shimmer as well. Below are pictures taken without and then with the camera flash, as well as a close up of the embossed image showing off that beautiful shimmer. I took some close-ups to help you see what I had done (and see that patterned paper a bit better). It's just gorgeous and I so wish it showed up better in the pictures!! Bottom cluster of flowers but this time with the flash - now you can really see that paper and some of the shimmer on the flowers as well. In this picture and the one below, you can see where I really went to town with my Lindy's Stamp Gang mists. All the flowers started out as plain white flowers... either dimensional roses from I Am Roses (yes you can get them from my online shop) or flat Bree flowers from Ada available in my shop here. I used a number of Lindy's Stamp Gang mists to colour my flowers (and some non-Lindy's for colours I didn't have), but all flowers feature Lindy's Stamp Gang Starburst mists on them. To colour the flowers, I misted them all generously with water first. I misted my chosen colour onto my craft mat then using my water brush I gently dabbed each colour along the edge of the flower petals. As each of the flowers is made of paper, they quickly soaked up the colour despite being already wet. Being so wet actually aided the spread of the colour and enabled the colour to dissipate to give quite a natural look. The light blue flowers were painted with Lindy's Stamp Gang Tiffany Lou Blue (though mine is under the old name of Tiffany's Blue) and then I misted them once they had dried with Lindy's Stamp Gang Teeth Chattering Teal. The dark blue were painted with Tattered Angels Glimmer Mist - Night B4 Christmas and accented with Lindy's Stamp Gang Twinkling Tinsel misted generously. The red flowers were painted with Tattered Angels Glimmer Mist - Lobster or Luminarte Radiant Rain Color Concentrate Poppy Red and were accented with Lindy's Stamp Gang Frostbitten Fuschia. The white flowers were all left plain but were misted with a combination of Lindy's Stamp Gang mists in Creme Brulee Cream (I love this name!!! ); Frozen Jack Frost and Don't Eat Golden Snow (another great name for a color). For all my flowers I was sure to use "The Gripper" a fabulous tool that enables you to dry or heat emboss with your heat gun (and we all know how much I love my heat gun) but without the risk of burning your fingers. Once again I love this tool so much... you can find it in my online store. Once the flowers were all coloured and dried I then selected some to curl the stems on for a little pop of something something then I adhered the flowers all in place using Helmar 450 Quick Dry Adhesive. As I have said before... this glue is like a glue gun but without the burnt fingers! I really, really love these products from Lindy's Stamp Gang and as I mentioned I am a convert. I will continue to grow my stash of mists and increase my colour range and you can be sure I will share them with you. All the colours I used on this project were from the Starbursts range of mists from Lindy's Stamp Gang. To see a project I created using the Moon Shadow Mists also from Lindy's Stamp Gang be sure to check out this blog post - Book of the Undead. The title might sound a bit suspect, but I know you will love the grungey look of the Moon Shadow Mists as much as I do. Be sure to follow my blog to keep up with any more projects I create with not only the Lindy's Stamp Gang Mists but also their embossing powders, Magicals and stamps. Wow..fab project! Love that Tiffanylou Blue, it's one of my favorites! I am definitely a fan of bright and intense colours, so they are all winners as far as I'm concerned! All the best of luck Paula. I would've loved to have put in an entry but I don't think I'd get it done in a day not to mention I don't own any of their products. Your key holder is da bomb! I will soon have all the Lindy's in stock on my website, so you'll be able to get it there!! And I'll be sure to let you know when the call goes out for the next round of applications.